A number of varied strategies for CO2 reduction being considered include: improved fuel and energy efficiency, forestation, and reforestation of lands to increase CO2 adsorption; capture CO2 for reuse and disposal in land and ocean reservoirs; and switching to less CO2 producing fuels. Recently, there has been a big boost for biofuels especially ethanol in response to high oil prices and need for replacement of toxic additives such as MTBE. However, substitution of ethanol for petroleum fuels does not address the needed CO2 reduction requirements. Already a significant progress is being made in improving energy efficiency, but most experts believe that even though it is beneficial, it is not sufficient to address the problem. 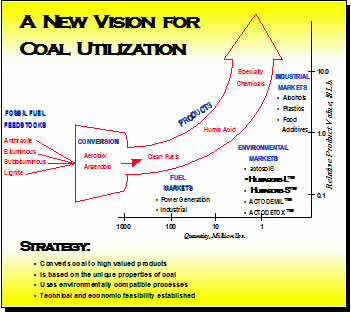 The MicGAS™ biotechnology approach sequesters carbon but as useful products while creating economic value from it. CO2 greenhouse gas while enhancing economic growth of the United States and worldwide economies. 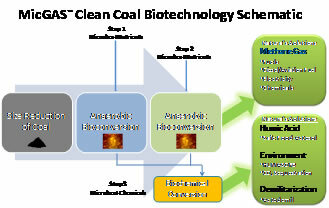 The innovative MicGAS technology is based upon applying natural microorganisms adapted to convert coal into clean fuels under anaerobic conditions. 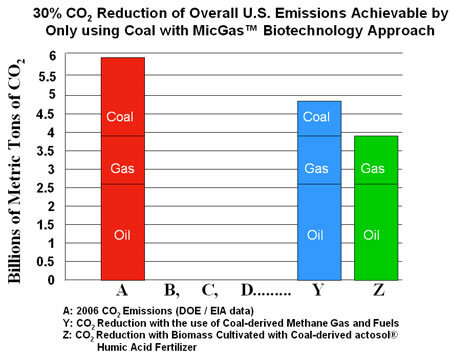 Unlike the conventional coal gasifier, the solid residue from the MicGAS anaerobic treatment is not a waste, but is rich in organic humic matter. The residual coal from this treatment is further subjected to biochemical process for extraction of humic acid This valuable byproduct has applications as a fertilizer material and also in environmental remediation. Recognizing the potential for MicGAS™ technology, ARCTECH has built a prototype-production facility to produce humic acid from inherently-humic rich lignite. At this facility in South Boston, Virginia, ARCTECH produces humic acid and formulates it into commercial actosol® fertilizer products. ARCTECH is also conducting several developmental projects focusing on environmental cleanup of the U.S. DOE Weapons Complex, and the safe disposal of DOD munitions. actosol® fertilizer products are being successfully marketed worldwide. In the U.S. actosol is widely used for golf course maintenance, landscaping, erosion control, and for agricultural crops such as corn, wheat, and soybean. actosol is also being successfully marketed in the Middle East to enhance growth of alfalfa, palm trees, and other crops grown both in greenhouses in the harsh desert climate. On the prosperous island of Mauritius, in the Indian Ocean, actosol is being used to increase yields of sugar cane, while in South Korea, actosol has been introduced into the marketplace for golf course and greenhouse applications. actosol® is presently being tested for distribution in the Chinese market. The primary benefit demonstrated in these applications is that yields of crops and plants increase 10-100%. This results in a net value gain of about 4 to 20 times of costs to a farmer. In 2004 USDA, approved the use of humic acid for organic food production. The US EPA in 2003 under FIFRA laws allows use of actosol® humic acid with pesticides as adjuvant and accepts actosol® safe for food production. actosol® is also on approval list of OMRI as organic fertilizer. ARCTECH is also successfully demonstrating applications of its humic acid-based ACTODEMIL® technology for recycling of nitrogen-containing energetics from conventional munitions into usable fertilizers. This fertilizer product has met all regulatory requirements, and was approved for use by the Nevada Division of Environmental Protection for land application.